The USC MPD Research Group visits with U.S. Ambassador to Indonesia Robert O. Blake, Jr. at the U.S. Embassy in Jakarta. 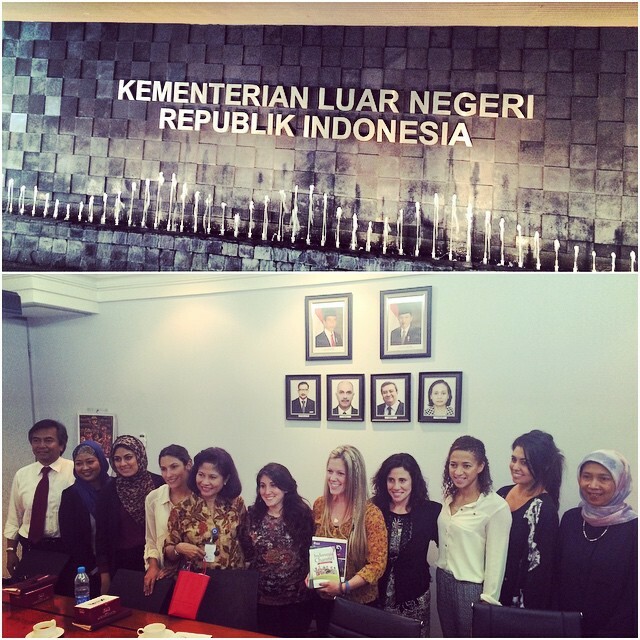 Our second day in Jakarta was also our first day of meetings. We had a packed schedule filled with visits to the U.S. Embassy at Jakarta, high-tech culture center @America, and human rights NGO KontraS. We all had some breakfast and eagerly headed out for a day of stimulating information-filled meetings. 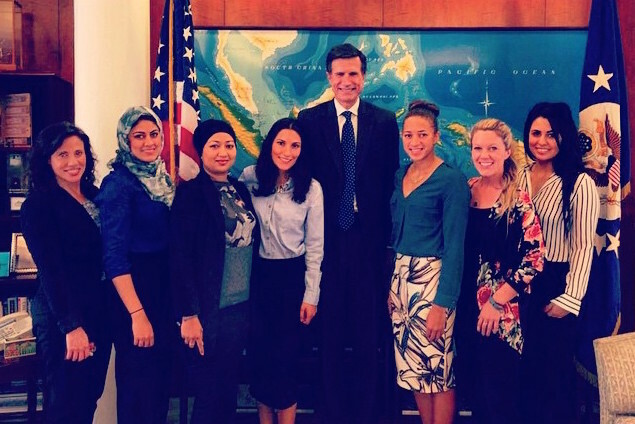 Ambassador Robert O. Blake was our first scheduled appointment. Upon entering the highly secured Embassy, fortunately only a few minutes drive and a corner turn from our hotel, we were greeted by Cultural Affairs Officer Deborah Lynn, who then introduced us to the Ambassador. In the brief time we had together, we discussed social media engagement between the U.S. Embassy and Indonesian people, challenges of his work, and the priorities of the office in general. After a quick photo and a few tweets, we were off to our next destination: @America. On the third floor of Pacific Place, a luxury mall in the city, @America cultural center is a high-tech digital initiative by the State Department, the only one of its kind located solely in Jakarta. We were guided through a tour of the office, which featured American cultural icons from Bon Jovi to Katy Perry, a performing center, and even a Google Earth interactive booth. Our hosts, @American staff as well as Deborah and Press Officer John Johnson explained to us their goal of increasing Indonesian youth applying for and attending American school as international students. Their messaging strategy was clear and precise: painting American education as the “Gold Standard,” offering high quality learning and a promising future. Additionally, we discussed current programming of @America, much of which revolved around the pluralistic Indonesian motto of unity and diversity. With an introduction to how the U.S. government is operating within Indonesia, the stage was set for our week of exploring the public diplomacy landscape of Indonesia. 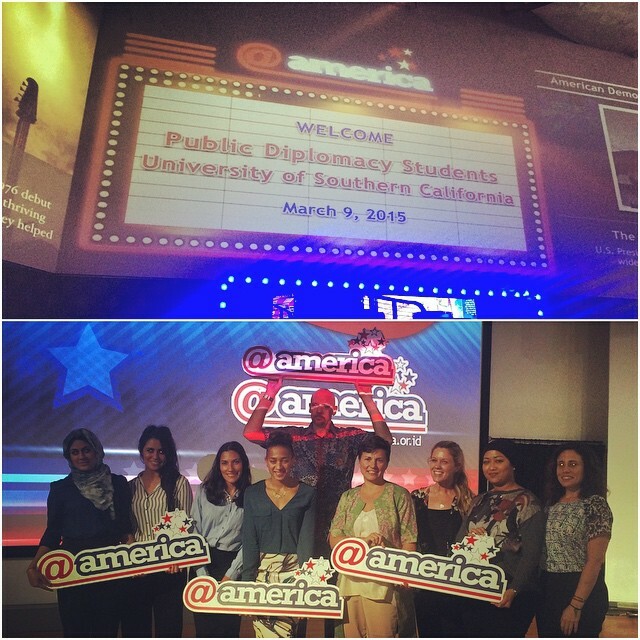 The USC MPD Research Group visits @America Cultural Center in Jakarta. First day exploring Jakarta. Here in front of the Jakarta’s mascot and the Monument Nasional, a symbol of the fight for Indonesia’s independence. Our first full day in Indonesia was as information-packed as a Jakarta traffic jam. After a 7-hour plane from Seoul we arrived at the Soekarno-Hatta International Airport at 2am Sunday night, a considerably quiet time to arrive. With not much to be seen from the window of our moving van, we were unsure of what to expect the next day except for humidity, jet lag and of course, traffic jams. The day dawned surprisingly bright and cool – as it rained earlier that morning and this helped cool the day down, making the humidity bearable. The light, occasional breeze was pleasantly welcomed as we ventured out to explore and experience Jakarta for ourselves alongside our knowledgeable guide. Throughout the day we visited a number of cultural sites, from the Museum Nasional to Monument Nasional. Museum Nasional is an archaeological, historical, ethnological and geographical museum, known among the locals as the “Elephant Building” or “Elephant Museum.” This is because located at the front of the museum is a bronze elephant statue gift from Thai King Chulalongkorn (Rama V) who visited the museum in 1871. The Museum itself is under purview of the Ministry of Culture and Tourism with the vision of it being the center of culture and tourism information and also “to increase the pride of civilization and national culture, and to strengthen unity and friendship among nations.” To facilitate the tourism aspect of its function, the Indonesian Heritage Society organizes not only free English tours, it also offers them in French, Japanese and Korean. The museum allowed for tourists to dig deeper into understanding the diverse Indonesian history, culture, ethnicities and languages, with a fascinating ethnology section that includes Dayak puppets and wooden statues from Nias, as well as beautiful textiles. The Monument Nasional, also known as Monas, is a 132m tower in the center of Merdeka Square, or Freedom Square, symbolizing the fight for Indonesia. The national monument was built as a commemoration of the struggle for independence. The Freedom Square boasted a number of street performers, as well as locals selling different items, ranging from inexpensive knockoff sunglasses to flowing, patterned pants for sale at very inexpensive prices. Of all the sites we visited, one stood out more than the rest. The Istiqlal Mosque is the largest mosque in Southeast Asia and third largest in the world. The word “istiqlal” is an Arabic word, meaning “independence.” This word can also be associated with “freedom” as the mosque was built to commemorate Indonesian independence. The Istiqlal Mosque is located next to the Catholic Jakarta Cathedral and the Freedom Square, as part of the then-President Sukarno’s grand vision of a strong, multi-faith state with the government at its center. This was an attempt to show to the world that religions could harmoniously co-exist. To further strengthen this point to the world, the designer of the mosque was a Christian architect from Sumatera named Frederik Silaban, who won the design competition held. The mosque is open to the general public, where tourists can take a tour with a Mosque employee. Though non-Muslims are not allowed in the main prayer hall, they are taken to the upper part of the mosque where they can view the main praying hall, and roam the hallways and terraces flanking the main building. Opening up the mosque to non-muslims allowed for the mysterious space to be viewed and understood by tourists from other faiths, ethnicities and nations. On February 16, 2014, Secretary of State John Kerry visited the mosque where he was taken on a 20-minute tour of the building accompanied by the Grand Imam Kyai al-Hajj Ali Mustafa Yaqub. President Obama himself visited the mosque in 2010 when he traveled to the archipelago. The Obama administration has worked hard to try and repair relations with the Muslim world, which were badly frayed under the previous administration with the invasion of Iraq in 2003. While walking down the streets of Jakarta, the locals were quick to call out “Obama,” when they found out we were traveling from the US. Our guide informed us the public sees Obama as “the Son of Indonesia” – someone who once lived there and would understand their heritage and culture. Perhaps the most salient consequences of the US-Indonesia relationship might have little to do with static considerations. The generally positive relationship between the United States and Indonesia starkly contrasts to common perceptions of Muslim countries and their relationships with the United States. Taking this into consideration, what implications for US relations with other Muslim majority countries can be understood? The relationship between the United States and Indonesia could provide one certain conclusion in regards to US relations with other Muslim majority counties: that no accurate generalizations can be made concerning countries with Muslim majority populations and their relationships with the United States. In a more globalized context where terrorist groups such as ISIS continue to dominate global dialogue concerning Islam, it becomes increasingly important to realize and keep in mind the diversity amongst Muslims themselves and Muslim majority countries. Indonesia is the world’s largest archipelago nation, made up of more than 17,000 islands and foreign visitor arrivals to Indonesia rose to 8.8 million in 2013, according to official figures by Statistics Indonesia. The United States and other Western powers have often referred to Indonesia – the world’s third-biggest democracy – as a bridge to the Muslim world. Ninety percent of Indonesia’s 250 million people identify themselves as Muslims, and most practice a moderate form of Islam. Having originated on the Arabian Peninsula during the seventh century, Islam has long been associated with the Middle East. More recently, this association has been strengthened by media coverage after the September 11th 2001 tragedies, which based public discourse concerning Islam upon terrorists’ characterizations of it, so much so that Islam became strongly associated with terrorism. Part of the Bush administration’s “War on Terror” contributed to the association between terrorism and the Middle East. With Islam and the Middle East continually broadcasted in the news in this manner, many people continue to believe that most Muslims are Middle Eastern, a belief that does not hold up to the facts, as reported by the Pew Research Center in 2013. As the global order is changing, emerging powers are being scrutinized as certain countries are developing into powerful, influential global players, and Indonesia is one of them. It has joined the club of Southeast Asia’s rising “tiger economies” alongside Singapore, Malaysia, and Thailand and is now constituted an economic steam engine in the Asia-Pacific. Located strategically, with large Muslim populations, and transforming into a young democracy, Indonesia has a lot to offer for our research with regards to the evolution of public diplomacy, the narrative of Islam within the context of globalization, modernity and democracy, and its ongoing democratization of foreign policy processes. The US-Indonesia relationship demonstrates the futility of attempting to generalize nations with a single trait in common, in this case Islam, while overlooking their innumerable political, social, economic, and cultural differences. It is time these factors are taken seriously into international dialogue instead of skimming over them. Once this is taken seriously, only then can the complex issues involving Islam and the West can be resolved. After a 12-hour flight we arrived in Seoul, South Korea for our extended layover between Los Angeles and Jakarta and a short introduction to Korean culture. As an airport known for extended layovers, Incheon Airport offers free transit and transfer tours as a glimpse of Korean culture for travelers. 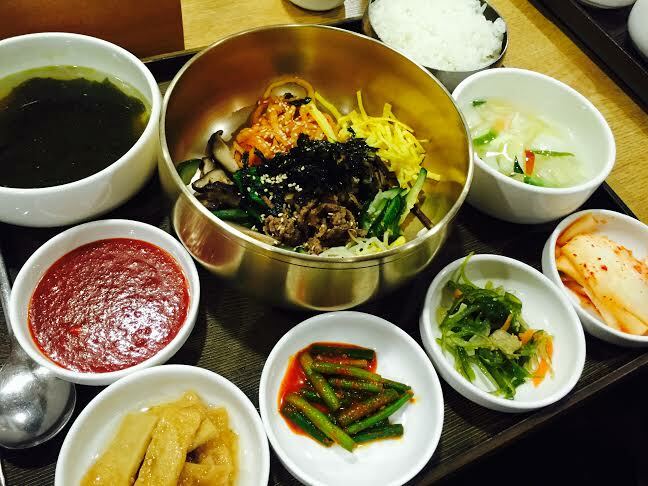 Our 5-hour Seoul Culture Transit Tour was a great way to spend our day in the capital city. Our first stop was the Gyeongbokgung (Prospering Virtue) Palace, the second largest palace in South Korea, originating in the Joseon Dynasty. Following our palace visit the group headed towards the Dongdaemun Design Plaza and shopping center on Insadong Street. While walking around Insadong Street, Danielle noticed the juxtaposition of Korean street vendors, new modern buildings, and well-known American businesses. She described this as a first-hand look at the effects of globalization, how South Korea can manage to combine tradition and modernity for an international audience, all within one city. We wish we had more time to experience even more of the city, but we were glad we had the opportunity for such a small glimpse. Once we returned to the airport for our onward flight to Jakarta, we noticed the Korea Traditional Cultural Center, providing live music, authentic crafts and entertainment for travelers. We walked by just in time for a live traditional Korean performance of Chamber Music, including Sanjo (free-style solo) and Gagok (lyric song cycles). It was interesting to see such a presentation of culture within one international airport. It seems there is an effort to present Korean culture to travelers by any means possible, even if only for a few hours. 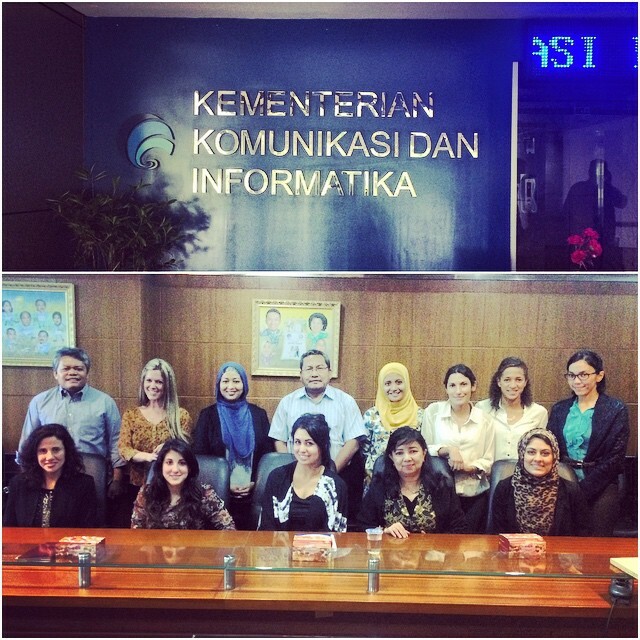 Our bags are packed, and we are ready to explore the public diplomacy landscape of Indonesia! Tonight we take off from LAX Airport for a layover in Seoul, South Korea before heading to Jakarta, Indonesia. Throughout the week our delegation of USC Master of Public Diplomacy graduate students will explore the country of Indonesia and its current public diplomacy efforts, how the Indonesian government is working to promote its image abroad, how the United States Government is working to improve its relations with the emerging power, as well as how non-state actors in Indonesia are working to influence policy and improve relations with other nations. On Monday we will be meeting at the U.S. Embassy with United States Ambassador Robert O. Blake, Jr to discuss current USG public diplomacy efforts. Following our visit with the Ambassador we will visit the @America cultural center and learn about the effectiveness of digital diplomacy within Indonesia. 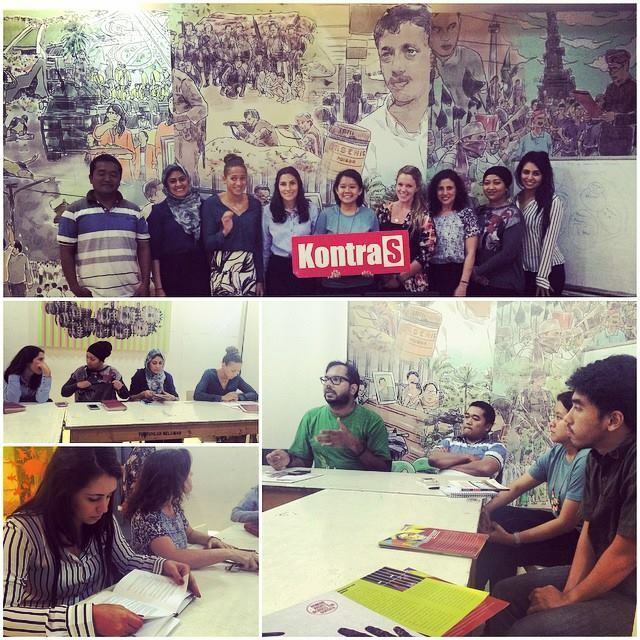 Our afternoon will end with a visit to local NGO Kontras, where we will explore current projects in relation to human rights within Indonesia. Tuesday we are scheduled to meet with both the Indonesian Ministry of Foreign Affairs and the Indonesian Ministry of Communication and Information Technology, where we hope to gauge ongoing and newly-implemented public diplomacy efforts by both Ministries. Wednesday will include visits with the International Organization for Migration, located in Jakarta, where we will meet with the Counter Trafficking and Labour Migration Unit. That afternoon we will meet with the Ministry of Religious Affairs, where we will learn about the Ministry’s current efforts in relation to faith diplomacy. Thursday we will round off our meetings in Bali with the Institute for Peace and Democracy at Udayana University, where we will discuss the Institute’s endeavors surrounding democracy promotion. Our time in Bali will also be spent partaking in cultural experiences. The level of gratitude and appreciation we feel toward those who helped make this experience possible for us is immense. We are excited to take off this evening, and we look forward to sharing this learning experience with you the entire way. Fight On!